In the short break after Christmas, I tried to finish some projects. I got a good start, but I have to say, I will be working on some for awhile. It seemed like all of Elisha's jeans and a couple of Silas' got holes in the knees at the same time! So, I went on a major "fix all the jeans" rampage. I think they turned out ok.
Another thing I worked on (I guess before Christmas) was an Advent calendar with names of Jesus. I wrote it on card stock this year, but I would like to put it on thin wooden rectangles next year so it will last. Each night has a name for Jesus. We read the passage that coordinates with the name and then we sing a song that has the name in it. It has been harder than I thought it would be to find songs for each name. I did it last year too and so this is my second edit. I think I still have a couple of changes for this year, but not as many. Anyway, it has been fun. Stephen and I enjoy singing, so it was fun to sing a special song every night. The kids are getting older now and can better try and listen for the special name of Jesus for the night. The project I am currently working on (and probably will be for the next few weeks) is one that I wanted to get finished at the end of last summer, but with all of the craziness of my Grandmothers not being well, I didn't even touch it. Our potato bin was made by Stephen's Grandpa Jim and was given to us for our wedding. The move over here wasn't kind to it, so I always felt I needed to do something to fix it. Also, our kids pushed in a couple of the screens which did not help its overall look either. On one visit to the States, my sisters and I went to a Norwegian festival and I saw some beautiful historical Norwegian furniture. I decided I needed to try rosemaling sometime. Now I have my chance with this potato bin. I researched an actual pattern from a Norwegian museum so it will be historically accurate. I am learning a lot and this is probably going to make the process go much slower as I feel I need to paint one side entirely over again! 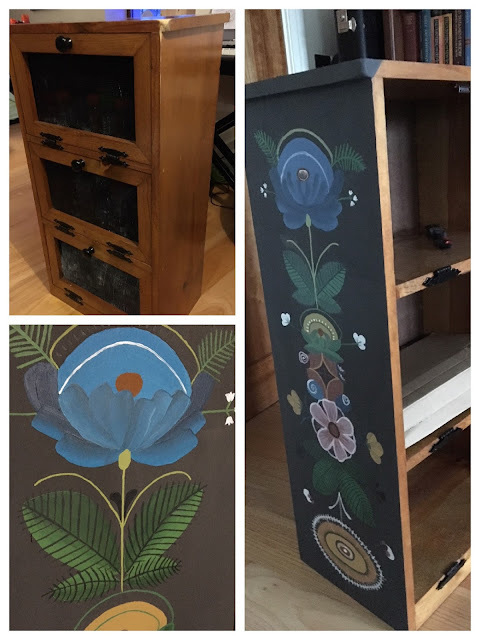 I first painted over the sides with dark grey chalk paint and am painting the flowers on in acrylic. I'll put a matt sealer over all of it at the end. It's been fun, but hard with two little boys running around (and throwing balls!). Since the break I haven't had as much time to work on it so it is going really slow. It will be nice once it is all finished. I am planning on using it for plastic storage containers and potatoes for the first time! It used to have my spices in it, but we are planning on getting separate storage for those attached on our cabinet doors. Hopefully it will all turn out great.